From sports content companies to digital marketing agencies and everything in between, the field of companies in corporate video production NY is ripe with content creators looking to make unique videos to build their brands. We’ve already shown you what it is that a full service video production company can bring to the table. But what is it that makes video testimonials, corporate videos, and branded content pieces all come together under one roof? The answer is versatility. Having a versatile team can go a long way in corporate video production NY and NJ. 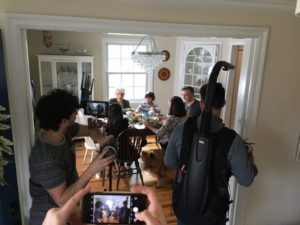 You deliver your vision, and we’re here to connect the dots between A and Z.
It’s more often than not in the corporate video production NY world, that the marketing executives we work with aren’t well-versed in the video production process. So, when we take on a project, we’re working not only as creatives, but as guides taking our clients through the entire process. In the pre-production, we supply mood and storyboards that help flesh out the concept. Next, we have our team of video producers and directors collaborate to construct a comprehensive shot list and script to achieve the video’s core messaging. A NY corporate video production company makes sure all the right pieces are in place before production day. By the time we’re ready to roll, our crew and producers have done their due diligence to make sure everything is ticked-off the checklist for the production to run smoothly. 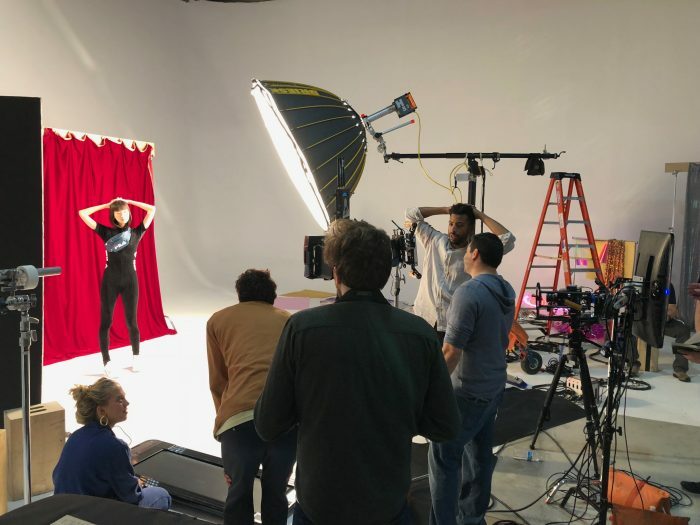 In our 10 plus years of corporate video production NY experience, ASL has been tasked with procuring some pretty unorthodox props and servicing quirky and niche production requests. Full service video production is about more than shooting and delivering a presentable video, it’s about doing everything between A to Z to make sure your client’s vision is fulfilled on screen. Here’s just a handful of the places where production has taken us. A common misconception is that all full service video production project requires a team member fit to perform their assigned duty. All you need is a camera operator to film, a handy grip, proper lighting and sound, and a trusty team of editors, right? Not quite. When working in corporate video production NY, you’re going to come across a pretty wide variety of projects. That isn’t to say that you can’t use the same audio engineer for a testimonial video and an event coverage video, but a lengthy roster of industry-specific experts to serve each New York corporate video production is essential to a full-service production. Some of our shoots with Barstool Sports have included requests that aren’t in line with our daily routine. However, in these situations our experience and adaptability shine. Our team has built a game show set, assembled an in-studio doctor’s office and science lab, and even put up a talk show set with a green screen right in the middle of Barstool’s office. A full service production makes sure that the client’s vision is brought to life, regardless of what it takes. Aside from our Barstool projects, we’ve seen requests from other clients equally as out there. Building a pirate ship in a dentist’s office for Aspen Dental (yes, this actually happened) and constructing a go-kart track and staging a food fight for TUMS were among the more memorable shoots. When working in NYC corporate video production, having one or two set designers isn’t enough. Supplying a deep bench of four or five set designers to call is what makes us versatile. There’s nothing worse than having a key aspect of the production fall through, and we’ve been in the game long enough to have backup plans atop backup plans in case our first solution didn’t end up being the last one. Production days adhere to very tight schedules, and inevitably, problems will arise. 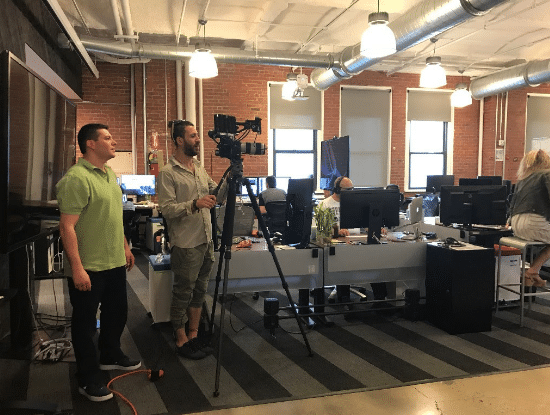 Especially in corporate video production NY, where productions run a mile a minute, having an experienced video crew goes a long way in anticipating potential roadblocks. A video producer’s job is to orchestrate pre-production, the shoot itself, and the post-production process swiftly into one cohesive final product. So, when a client signs up for a full service production, they should be getting a producer committed to bringing every aspect of the video together and handling any hitches that may arise with absolute composure. We are recognized as a top Video Production Company on DesignRush.